AUMUND conveying equipment is frequently supplied to FLSmidth for the complete plants that it installs for customers in the cement and minerals industries all over the world. 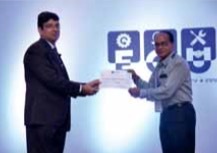 AUMUND Engineering Private Ltd. was among select suppliers invited by FLSmidth to a conference in Chennai, India. Its Indian subsidiary, FLSmidth Pvt. Ltd., hosted the two-day meeting. As a leading expert in bulk materials handling, AUMUND works closely with FLS on specialist solutions for conveying and storing technology, incorp- orating AUMUND machines and especially its flagship products, belt and chain bucket elevators, into the overall FLS projects. The first day of the meeting in Chennai was dedicated to interaction between the procurement and engineering teams of FLS and their suppliers. The various parties exchanged views, experiences and suggestions for the future on all aspects of the project processes, from enquiry through design, manufacturing and installation to the final payment stage. On day two FLS gave detailed presentations about its capabilities and future prospects in various industrial segments, followed by general discussions on the current market situation and how FLS and its suppliers can enjoy continued success. FLS detailed its expectations in the main target areas of: timely response from suppliers without the need for FLS to expedite; reduction in delivery times; value- added engineering; and competitive pricing structure. Germany), SCHADE Lagertechnik GmbH (Gelsenkirchen, Germany), SAMSON Materials Handling Ltd. (Ely, England), as well as AUMUND Group Field Service GmbH and AUMUND Logistic GmbH (Rheinberg, Germany) are consolidated under the umbrella of the AUMUND Group. In conjunction with the headquarters of the manufacturing companies, the global conveying and storage technology business is spearheaded through a total of ten locations in Asia, Europe, North and South America and a total of five warehouses in Germany, USA, Brazil, Hong Kong and Saudi Arabia.